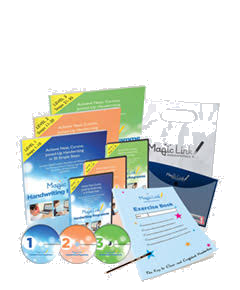 The Magic Link Handwriting Programme ® teaches neat, cursive, joined-up handwriting in 30 simple steps. The simple Magic Link® font has no confusing lead-in or entry strokes. Grades improve as handwriting becomes neater and faster and self-confidence increases. Messy handwriting is not a sign of low intelligence. Video lessons are available on DVD (Amazon UK) or can be purchased online as video tutorial lessons with printable worksheets. Or contact a certified Magic Link teacher for face-to-face teaching. Recommended by teachers, parents, educational psychologists and occupational therapists. It’s never too late to improve handwriting! AS SEEN ON DRAGONS DEN!! Cursive writing, using the Magic Link Programme, helps students with dyslexia. The Magic Link course improves grades and success in 7 plus exams, 11 plus exams, GCSE and A levels. GOOD HANDWRITING IS CRUCIAL FOR EXAM SUCCESS! Many assessments are based on written work, particularly in time-limited written examinations. Fast and legible handwriting is essential. Children, students, teachers, lecturers, parents feel happy, confident and inspired by good handwriting skills. Good handwriting is essential long after graduation and is part of our daily lives.